The Quick Entry area allows you to quickly capture day to day records of time, expenses and mileage for directors and employees. Time spent working on customer projects, business journeys using a personal vehicle and business expenses paid for using personal money are recorded in the Quick Entry area. By capturing records here, invoices can be created in seconds and any out of pocket expenses will automatically be reimbursed on payslips. If you have multiple directors or employees, they have separate records and you can switch between them at the top of the page. Recording time spent working for your customers in inniAccounts helps ensure you don’t under or over charge. 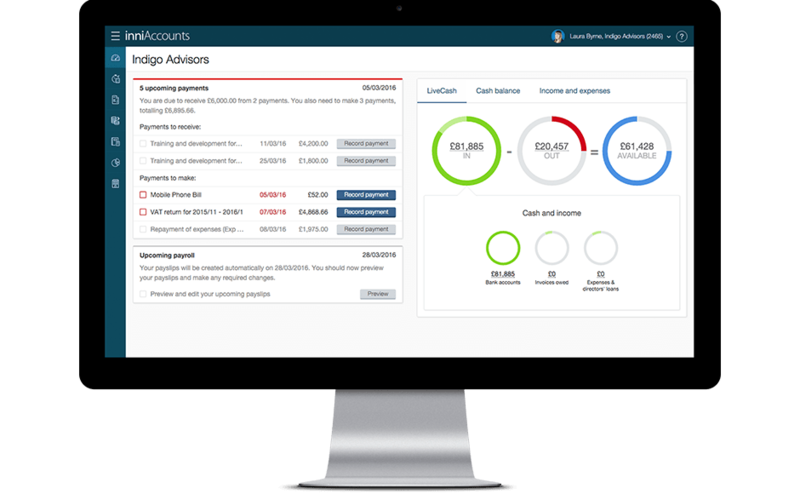 Your records are tracked and any work you’ve not charged your client for can be added to your next invoice with a couple of clicks. Once you’ve created your contract and set up project tasks, you can enter the time worked by each employee then click save. If the charge rate you entered in your clients contract is in hours, enter the numbers of hours worked in your timesheet. Half an hour would be 0.5 and 15 minutes, 0.25. If the charge rate in your contract is a day rate, enter 1 in your timesheet for a full day, 0.5 for a half day. If you’ve travelled to a client’s premises that day you can check the ‘default mileage’ box. The default mileage figure is called up from your contract settings and by checking the box it will automatically make an entry into your mileage log. No contracts or tasks showing? There are 2 things to check if you have no contracts in your timesheet. The first is to check the date range specified in your contract settings – ensure that the start and end date cover the week you need to book time for. The second is your contract tasks. At least one task is required in a contract for it to appear in the timesheet. Both of these are in your contract settings. The mileage log button is at the bottom of your timesheet and it allows you to keep track of your business journeys when using a personal vehicle. You can enter the details of the journey including the start and end destinations, the distance travelled and the type of vehicle used. As it is a business expense using a personal vehicle, your company needs to reimburse the employee and this is done on the next payslip. The mileage log also allows you to charge clients – perhaps for attending an off-site meeting they’ve agreed to cover the cost of. When you record the journey, select a contract from the drop-down list, check the ‘bill to client’ check box and enter the rate to charge to the client. Next time you invoice your client you will be able to add this journey to your invoice. Ensuring your claim valid business expenses is a great way to reduce your tax bill. Mileage claims soon add up and you need to cover the costs of running your personal vehicle for business use. Be careful though – don’t double account for travel expenses: you cannot claim for the cost of fuel, servicing, road tax etc when you claim using the HMRC approved rates – all the costs are included in the mileage rates. Sometimes it is necessary or convenient to purchase items using personal money instead of a business debit or credit card. If items are paid for using personal money they need to be recorded in the Quick Entry area so your company can reimburse the employee. You can record a reimbursable business expense by clicking the ‘Enter new transaction’ button then selecting either ‘expense’ for day to day expenses or ‘asset purchase’ for purchasing business assets. Enter the details on the screen and press save. If you wish to bill the expense back to a client, for example a hotel bill they’ve agreed to pay, then select the client from the drop down list – this expense will be available the next time you invoice the client. Reimbursement of your expenses is handled during payroll and the employees next payslip can include any expenses due. If you don’t run payroll or want to bypass the payslip, you can use an expense account that allows you to repay expenses directly. If an expense or purchase has been paid for directly from a business bank account or using a company credit card, then record it in your bookkeeping page instead. Does the inniaccounts software have the ability to flag when the 10,000 miles at 0.45p/mile (or other HM approved rate) has been reached and automatically reduce it to the lower rate, to avoid the risk over overpayment? Hi Mark. Yes, once the 10,000 mile limit is reached the software changes the rate to 25p per mile.